Public cloud spending is fueling IT tech spending growth, according to second-quarter data compiled by Synergy Research Group. Their numbers indicate that spending on the public cloud has grown by 35 percent, while quarterly spending on all data center hardware and software has grown by just 5 percent. The private cloud infrastructure market has also grown, by a respectable 18 percent, while spending on traditional, non-cloud data center hardware and software has dropped by 18 percent. The rapidly growing numbers connected with public cloud spending are to be expected. Not only are the two industry-leading public clouds, Amazon Web Services and Microsoft Azure, continuing to enjoy a dramatic rise in adoption, other cloud services -- which would include smaller IaaS and PaaS services as well as SaaS players -- continue to spend large amounts of money to meet increasing demand, whether actual or projected. It's also not much of a surprise that spending for private clouds rose by as much as traditional non-cloud data center spending declined, as companies scramble to take advantage of cloud-native technologies and make investments in hybrid clouds. There is also the enterprise's increasing reliance on software-as-a-service in lieu of traditional apps running on-prem, resulting in smaller private data center workloads. Accoding to Synergy, original design manufacturers, or ODMs, are the recipients of the largest portion of public cloud spending, led by Cisco and followed by Dell EMC and Hewlett Packard Enterprise. In private cloud, Dell EMC led the way, followed by HPE and Microsoft, with Cisco making a fourth-place showing. The same four vendors led in the non-cloud data center market, but with different rankings. "With cloud service revenues continuing to grow by over 40 percent per year, enterprise SaaS revenue growing by over 30 percent, and search/social networking revenues growing by over 20 percent, it is little wonder that this is all pulling through continued strong growth in spending on public cloud infrastructure," John Dinsdale, a chief analyst and research director at Synergy, said in a statement. "While some of this is essentially spend resulting from new services and applications, a lot of the increase also comes at the expense of enterprises investing in their own data centers. One outcome is that public cloud build is enabling strong growth in ODMs and white box solutions, so the data center infrastructure market is becoming ever more competitive." Synergy points out that across the board -- including cloud and non-cloud, hardware and software -- total data center infrastructure equipment revenues were over $30 billion in the second quarter. Public cloud infrastructure accounted for over 30 percent of that total, with private cloud or cloud-enabled infrastructure accounting for over a third. So where is the money going? Servers, operating systems, storage, networking, and virtualization software accounted for 96 percent of the Q2 spending, with most of the rest going to network security and management software. 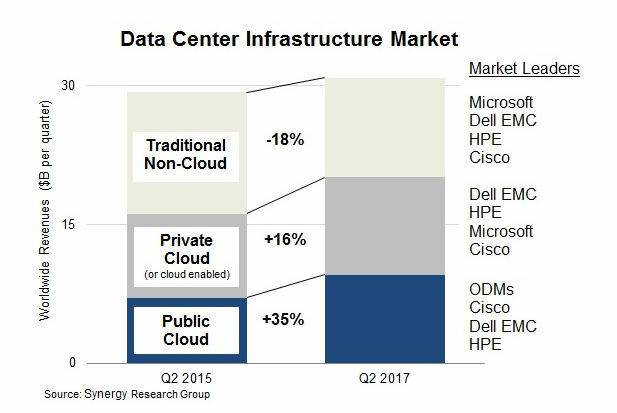 HPE is the leader in server revenues, Dell EMC has a strong lead in storage and Cisco is dominant in the networking segment. Microsoft's showing, of course, is due to its server operating systems and virtualization applications. Bubbling under the top four: IBM, VMware, Huawei, Lenovo, Oracle and NetApp.